I don't really understand what it means. Why does it only mark the centre of the road? What else should it do? Does it refer to overtaking? Is the sign saying that, contrary to its common meaning, this broken line does not indicate that it is allowed to overtake? It's my best guess, but I'm not convinced, because in that case I'd expect a solid line, not a broken one and a sign. So, what does it mean? And if it's really about overtaking, why didn't they use a solid line? In short: It means "Don't assume any of the usual meanings of a broken line in Spain, except for marking the center of the road". The meaning is obvious. At least, it seems obvious for drivers in Spain. In Spain, a broken line means that you can overtake while a continuous line means you can't, and in curvy roads the line changes very often from broken to continuous (and even to continuous for one side and broken for the other) according to circumstances of the road - mostly about visibility but also about intersections with other roads. In roads with that sign, as it reads, the broken line just marks the center of the road and it doesn't show whether you can overtake. Therefore, you must assess if you can overtake using the other rules in road code, which basically fall back to the rule that you can overtake where visibility is enough to make sure that there isn't an incoming vehicle in the opposite direction. If the road were narrower than the one depicted in the OP, the sign would be also warning that we can't assume that every vehicle will be completely in its side of the line, especially for trucks. In that case, there would likely be a speed limitation signal. Those roads are just small roads with little traffic, some of them just upgraded from unpaved tracks. That kind of small roads in some places in Spain used to carry no lines at all. A better improvement could include complete road marks and a lot of traffic signs, but that improvement is nor easy not cheap, and for small roads with little traffic it is not done. Therefore, the road is just an asphalt strip with a broken line in the middle. From experience, I must add that it isn't hard to drive in those roads - at least, lack of continuous/broken line doesn't make it harder than driving in any other narrow curvy road. As any driver knows, you can't overtake if you can't check that there is no incoming vehicle, and you don't need a continuous line to tell that you can see the road more than a few metres ahead because a curve obstructs the view. It definitely means you mustn't assume *any meaning whatsoever, re overtaking, turning, or even whether "your" side of the road is actually all yours, exactly as it says, over and above that it marks the centre of the road. If you're on your side of the broken line, you can't assume oncoming traffic will be entirely on the other side. The line only marks the centre, and does NOT even divide the lanes. Hence the usage on narrow roads. If I understand it correctly, it has to do with overtaking, but the signage is really confusing. In Spain, a continuous line means that overtaking is prohibited and it is in no case allowed to cross the line. That means, that it is even prohibited to turn left. It is allowed to overtake bicyclists, if you are able to keep a safe distance without actually crossing the continuous line. A broken line means that you are allowed to overtake if traffic and visibility allows you to do so safely. The sign you have found is quite common on narrow mountain roads and used together with a broken middle line. I guess it is supposed to be a reminder that even if it is strictly speaking not prohibited to overtake (due to the broken line), the road is too narrow and curvy at most places to do so safely. You may however have a chance driving uphill to quickly overtake a bicyclist or turn left, if that is required. Had they used a continuous line, you would not even had been allowed to turn left, or pass bicyclists. In many countries, it is common to indicate with the broken line that it is a place where it is safely possible to overtake. It means "don't rely on the lines only, use your common sense especially when invading the opposite side such as when overtaking or turning left". The sign also intends to warn that you might encounter large vehicles taking some of "your" road just to be able to take a turn or even circulate on a straight section. I've seen a variation of this sign in rural or mountaineous roads in Castelló. That area is very sparsely populated, there's few traffic, road maintenance could be way better and the road features (shorter straight sections, bends, mountain passes) could make it impossible to overtake for larger/heavier vehicles (buses, trucks, cars) but be perfectly fine for lighter ones (cars, motorbikes). An accident in those sparsely populated areas could mean that help is going to take a while to arrive. Not the answer you're looking for? 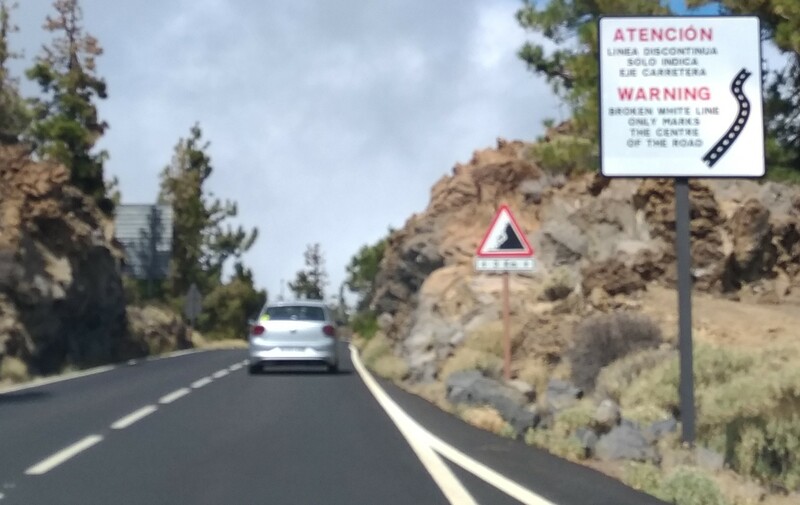 Browse other questions tagged spain canary-islands road-signs or ask your own question.